Jane Katkova receives a Brilliantly Minded Women Award! 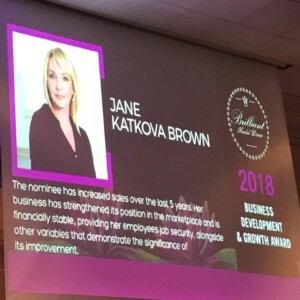 Our own Jane Katkova, the Principal Counsel & Founder of the Firm, has become a recipient of the Business Growth & Leadership Award by Brilliant Minded Women Foundation. Jane Katkova has always had a keen interest in helping people, following a tradition established in her family. A humanitarian at heart and an immigrant herself, she chose to build a career in helping people migrate to Canada. In 1995, she established a boutique immigration law consultancy firm, Jane Katkova & Associates, in Toronto. After 20 years of practice with a 98% success track record, Jane Katkova-Brown secured a reputation as a highly competent advocate specializing in all types of permanent, temporary and corporate Canadian immigration matters. Jane Katkova specializes in building strategies aimed at resolving complex immigration cases. With a strong eye for detail and in-depth knowledge of legislation, she undertakes a thorough approach to every matter she handles and combines her expertise with great compassion for her clients. Her expertise includes assisting Canadian and International corporations in moving human resources to Canada for temporary or permanent employment, as well as handling intra-company transferee, NAFTA and GATS related cases. She also assists high-net-worth individuals in obtaining citizenship, professionals and investors in getting permanent residency, and entrepreneurs in acquiring Start-Up visas. Jane Katkova-Brown is well versed in advocating for her clients and she takes pride in creating long-lasting relationships with them. The mission of the organization is to acknowledge the achievements and leadership of women, to support and encourage them in the development of their aspirations, and to celebrate how much they matter. The Organization does this by hosting an annual gala at which they award highly accomplished women who have made a difference in the world, they give academic scholarships to outstanding young females pursuing post-secondary education, and they curate opportunities for mentorship, connection and development for all BMW Organization Awardees and Scholarship Holders throughout the year.